The Friends of the Old Croton Aqueduct strive to educate the public about the extraordinary history of water in New York City. For more articles and information, please check our EDUCATION section. 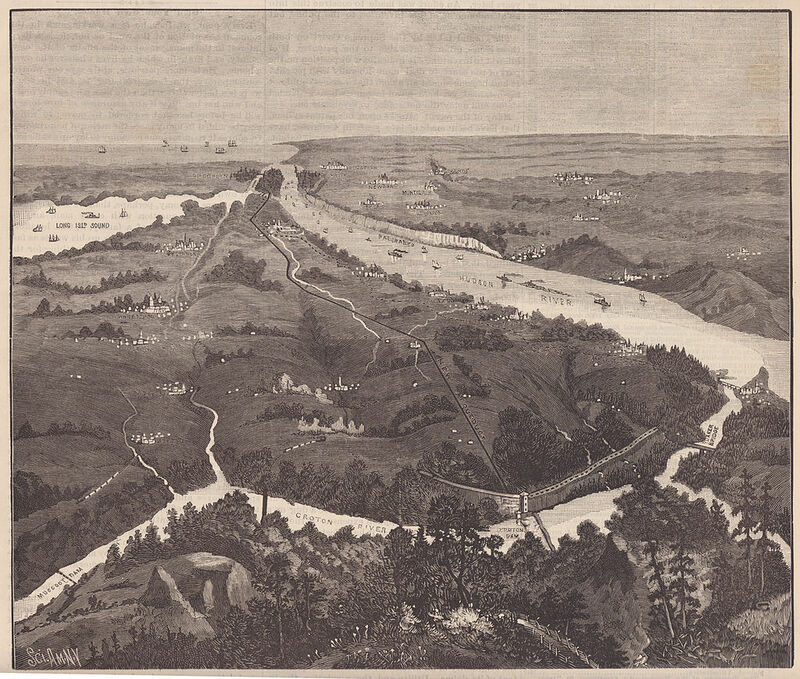 The Aqueduct was built in response to the fires and epidemics that repeatedly devastated New York City, owing in part to its inadequate water supply and contaminated wells. Major David B. Douglass, the project's first chief engineer, planned the route and structures and established the project's hydraulic principles. He was succeeded in 1836 by John B. Jervis, who achieved the final design of the Aqueduct and its major structures and led the complex construction effort. Work began in 1837, carried out largely by Irish immigrant labor. For most of its length, the Aqueduct is a horseshoe-shaped brick tunnel 8.5 feet high by 7.5 feet wide, set on a stone foundation and protected with an earthen cover and stone facing at embankment walls. Designed on principles dating from Roman times, the gravity-fed tube, dropping gently 13 inches per mile, challenged its builders to maintain this steady gradient through a varied terrain. To do so the Aqueduct was cut into hillsides, set level on the ground, tunneled through rock, and carried over valleys and streams on massive stone and earth embankments and – at Sing Sing Kill, the Nepperhan (Saw Mill) River, and the Harlem River - across arched bridges. Typically it is partly buried, with a telltale mound encasing it. As one learns to read the "clues." an understanding of how the tunnel engages the landscape deepens the trail experience. 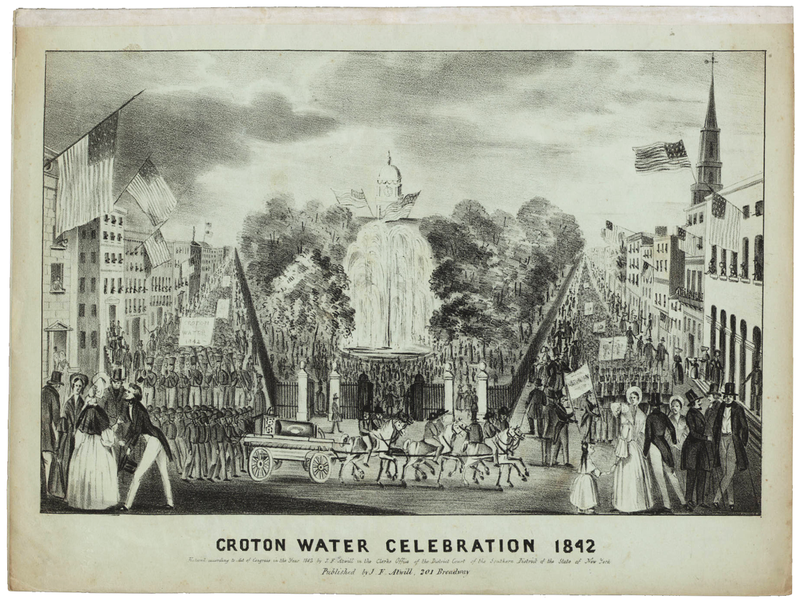 Croton water first entered the Aqueduct at 5 am on June 22, 1842 (followed by a dauntless crew in a small boat, the Croton Maid) and emerged at the Harlem River 22 hours later. The water eventually filled two above-ground reservoirs – on the present sites of the Great Lawn in Central Park and the New York Public Library on Fifth Avenue – to great civic rejoicing. Print from CrotonHistory.org - read more there about the celebration. The trail is virtually as old as the Aqueduct. It was created for reasons of security - to prevent local opponents of this massive, intrusive construction from attempting to sabotage the water supply - and to facilitate workers' access to the water conduit. It was not for intended for recreational purposes, though it quickly started being used that way. Until 1955 the Old Croton Aqueduct brought water to New York City. (The northernmost portion reopened in 1987 and continues to supply water to the town of Ossining.) 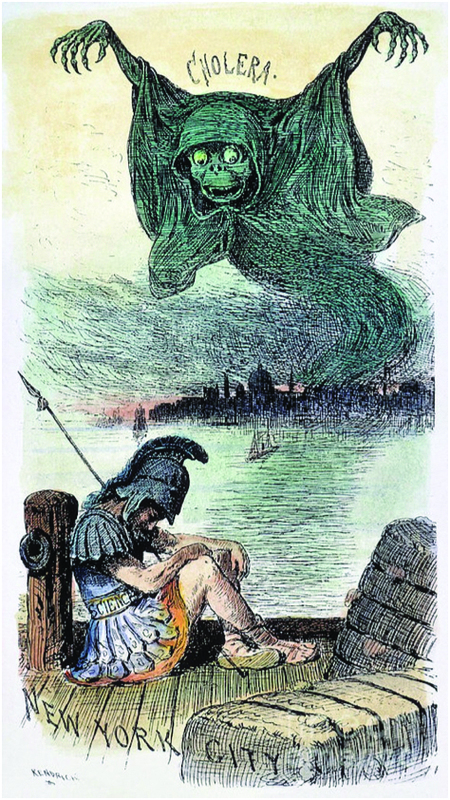 Though the Aqueduct was built to meet the city's needs for 100 years, the supply was soon insufficient due to the spiraling population growth to which it contributed. 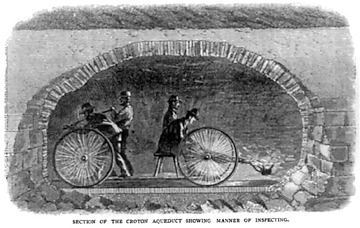 The New Croton Aqueduct, triple the size and much deeper underground, lies a few miles to the east. Built under Chief Engineer B. S. Church, it began service in 1890 and remains in service today. It has no walking trail. In 1968, New York State purchased from the city the land and structures that constituted the Weschester County section of the Old Croton Aqueduct, between Croton Gorge Park and the Yonkers-New York City line. This 26.2-mile portion of the total 41-mile Aqueduct route became the Old Croton Aqueduct State Historic Park, a recreational and cultural resource that appeals to a wide range of visitors. Tree-lined and grassy, traversing local villages and varied landscapes, the trail offers the pleasures of nature and glimpses of historic and architectural treasures along the way. Twenty-two miles are a designated part of the Hudson River Valley Greenway Trail, and sections are being incorporated into Westchester County's RiverWalk. While the state park designation ends at the New York City line, the Aqueduct continues for four or five miles through the Bronx. There its green corridor, managed by New York Parks & Recreation, follows a southward route through Van Cortlandt Park, past the east edge of Jerome Park Reservoir and along Aqueduct and University avenues to the famed High Bridge, which carried water in iron pipes cross the Harlem River to Manhattan to serve a growing population. A fuller history of the Aqueduct can be found a the Ossining Heritage Area and Keeper's House visitor centers and in "Water for Gotham: A History" by Gerard Koeppel, 2000, Princeton University Press. An archive of Aqueduct material, donated by William Lee Frost to Croton-on-Hudson's Historical Reference Room (Municipal Building), may also be consulted; call 914-271-4574. 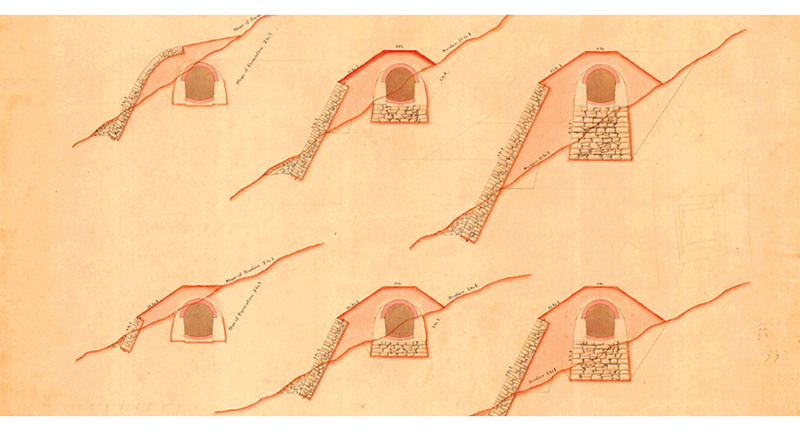 The FOCA Newsletter was published several times a year and contained scholarly articles on the history, engineering, and sociological importance of the Aqueduct, as well as lively stories about the people who built it.